Post updated Mar 2016. Originally posted March 2015. Gluten free, dairy free baking has been such an adventure. I’ve had to learn new techniques, combine different flours, and rework lots of my old favorite recipes. Whether it’s coming up with an amazing gluten free pie crust recipe, some seriously good chocolate cookies, or cobbling together a new vegan birthday frosting, it’s been a lot of delicious experimenting. Some things have come together pretty easily, and others have been disastrous. These brownies were, thankfully, in the first group. They were everything I dreamed they could be–fudgy and rich with a crispy exterior and rich chocolatey interior. I absolutely love them. I’ve made them countless times in the last year, enjoying them plain or putting them into dairy free ice cream. They haven’t steered us wrong yet. My big secret? It’s been better than any gluten free flour I’ve tried for brownies. They get that gorgeous fudgy texture I love so much (I’m not a cake-y brownie fan), and I love that the flour isn’t empty calories. Instead, it’s just ground almonds! Baking Powder vs. Baking Soda – A really smart reader explained to me that baking powder helps puff while baking soda helps spread. The reason I used baking soda instead of powder was because it’s paleo friendly (many baking powders contain cornstarch with isn’t paleo approved). After trying it both ways, I totally agree with her! If you want more puff to your brownies, use the baking powder. If you’re paleo or avoiding corn, stick with baking soda. 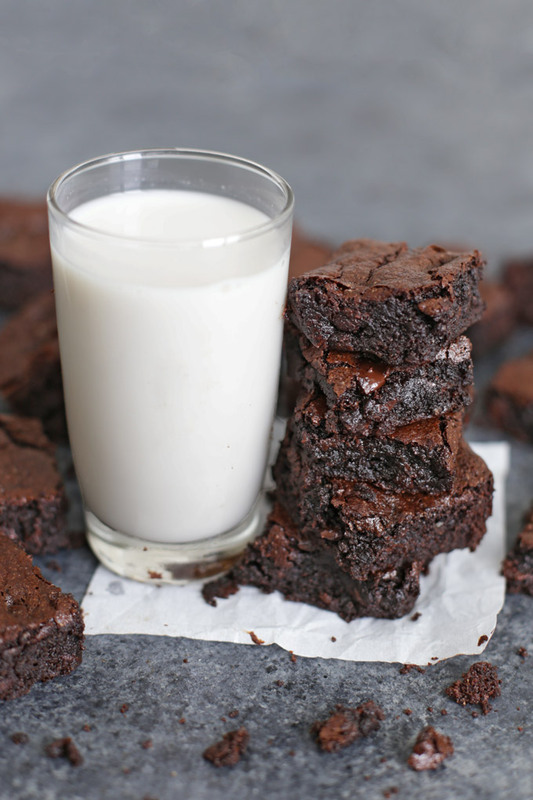 (The brownies in the photos used baking soda). These intensely fudgy brownies are SO GOOD no one will ever guess they’re also gluten, dairy AND grain free. They’re everything a brownie should be! The brownies look fabulous! And I already have all the ingredients to make them… I think I know what I’ll be doing tonight. Also, really jealous of your perfect brownie cutting skills. Paige – Here’s my secret: I chill them first! They cut perfectly when chilled. And…if you like to have them warm, cut brownies with a plastic knife! I have tried many alternative gluten free healthy brownie recipes. Your recipe is unsurpassed delicious! I like to also garnish the brownies while still cooling, with a natural chocolate glaze and atop it with halved walnuts. Can’t wait to try other “ONE LOVELY LIFE” recipes! Oh my GOSH! THANK YOU!!! These look amazing! I’m always on the lookout for a great gf brownie 🙂 Do you think Trader Joe’s almond meal would work here, or would I need actual almond flour? Natalie – When I tried it, it did work, though the texture was a bit more grainy with the coarser grind of nuts. But it still worked for me! You may want to add an extra Tablespoon of almond meal. So excited to make these! If I try coconut sugar, do you recommend the same amount? I do! If you add much more or less it will mess with the texture. What would the serving size be? Also do you know how many carbs per serving? Kathleen – I usually cut these into 16 squares. As for the carbs, I’m sorry I don’t have nutrition facts for each recipe yet, but you can plug this recipe into any online calculator to get a good idea. My favorite is MyFitnessPal (website or free app). You can import recipes from anywhere on the web! Megan – I haven’t tried them with a flax egg, but I’d LOVE to know how they turn out for you if you try them this way! I made these and they were great but wouldn’t set. I used flax eggs. Everything else was the same. Not sure what happened but I ended up having to good them so long that all the edges burnt. Any other suggestions? I used baking powder instead of soda for less sodium. Carrie – It could very well be the flax eggs and baking powder substitutions. (I haven’t made them with flax eggs, but someone else had a similar issue.) The brownies also tend to completely set as they cool, so if you kept testing them while hot, they’d probably continue to test gooey. I’m sorry that happened! I just made these with ground chia seed eggs (3T water:1 T ground chia) and it turned out fine, not great. The batter hardly rose and made about 1/2″ thick brownies, whereas the original recipe makes a bit of a fluffier brownie. Taste-wise, about the same but I much prefer the “original recipe” posted here with the eggs. hope that helps anyone in the future!! Thank you for chiming in with your results! Thank you. These look delicious. Just as an FYI , coconut sugar does not have a lower glycemic index than any other sugar. This was based on one sketchy study from the phillipines which has been proven wrong by other studies since. A lot on this on the internet. Swerve is a sugar substitute which is safe and has a relatively low carb content. Thanks for the head’s up! I’ll have to look into that. Actually that is false, it is lower on glycemic index and I know because I have gestational diabetes and played around with sugars and monitored my glucose levels 4 times a day and after eating paleo chocolate chip cookies made with coconut sugar. Thanks for following up with this for us! Your recipe is fantastic! Thank you for your research, and expertise! Regarding “Swerve” sweetener: it sounded interesting, so I did a search for reviews and feedback from people who have tried it, or who have been using it. I see a lot of reservations expressed, and negative input, regarding the taste, after-taste, and concerns about the undisclosed processes Swerve employs in order to produce it. Personally, I want products that have not been messed around with since nature created them. I save a lot of money, and avoid a lot of disappointment, by perusing baking sites and blogs for feedback on new products. Plus, I always wonder about the potential for product placement plugs, used by people due to potential compensation. Pamela – Thanks for your comment! Swerve isn’t for me either, but I have lots of friends who swear by it. To each her own! Very tender ! I used the darkest chocolate I could find and topped them with walnut halfs. Super! Oh, I LOVE hearing this! Thank you so much for sharing Carol!!! Hi there! I just made these exactly as listed. However, the sides raised up around the edge while the middle didnt rise at all. The top seemed a little crunchy while the inside wasn’t. I think it’s a win because they are much healthier, but thought the cooking was a bit weird, with the sides raising up so high. Wonder what happened? Molly – Hm… My sides usually puff up a tiny bit, but not a lot. I wonder what happened? I’ll have to think about it! I’m going to try it again and add baking powder as well, to make them raise more. I think it needs just a smidgen. Will let you know how it goes! I’m also going to reduce the oil to maybe 3.5 Tablespoons…will let you know! 🙂 I think this is a great base though, they are very fudgy and I dont mind the almond flour! I hope your adjustments help! Thanks so much for your comments! Hi! So I made these again today but instead used baking powder instead of soda and they turned out absolutely perfect! 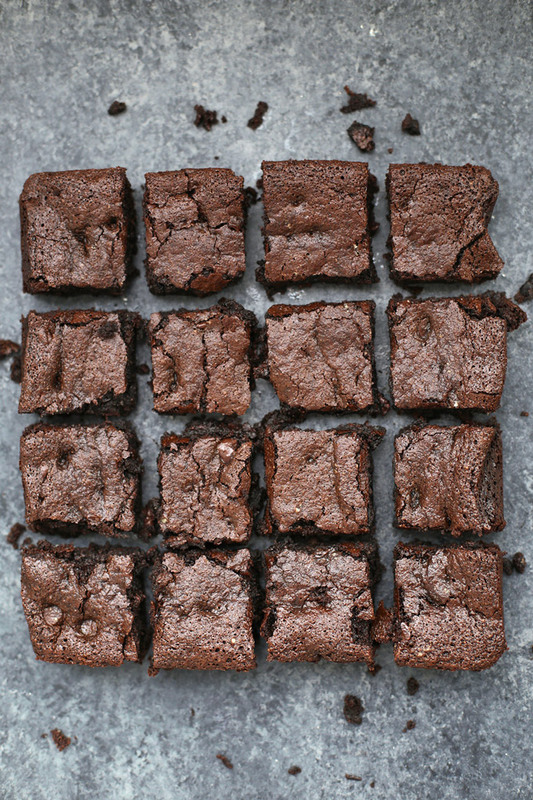 I checked a number of other brownie recipes and they all use baking powder (none of them use soda – soda spreads, powder puffs, which is what these need in a 8×8 pan). Maybe check it out, these are so perfect now! Thanks for the recipe!!! Molly – THANK YOU for reporting back! Honestly, I’m wondering now if I made a typo. I’ll test it your way and update again! Lower temp of oven a bit and add a couple minutes? 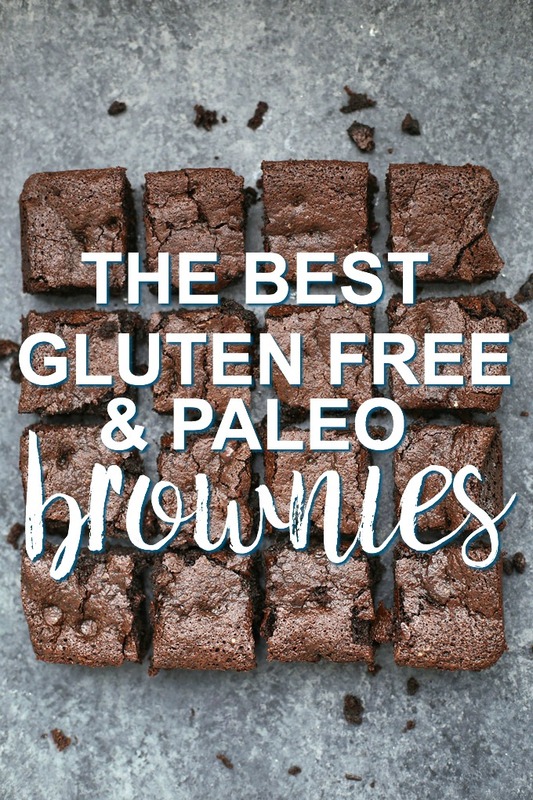 LOVE love LOVED them!I have tried several different healthy brownie recipes and these are the BOMB! Oh, I’m so glad to hear that! You made my day!!! JustM – I’m glad you’re enjoying them! One thing you can do is pull them out about halfway through and add the salt on top them, then pop them back in to finish cooking. It sometimes helps the salt stick a little better to the tops. 🙂 Hope that helps! Made them with baking powder instead of baking soda and added 1/4 tsp of Nutmeg and OH MY GOD these are the best things I’ve ever tasted!!! I have Celiacs and a dairy allergy so there are very few baked desserts that actually taste this good and don’t hurt my tummy at all! I also use dairy free chocolate chips and the coconut sugar. Cooking time is perfect, sprinkling the sea salt with 8-10 minutes left in cooking works beautifully. I think I am going to have to make another batch tomorrow… THANK YOU FOR SHARING THIS!!!! YUM! The addition of nutmeg sounds incredible!!! This is the best paleo baking recipe I’ve come across to date. The texture and flavor are spot on. I am always disappointed when baking paleo, but not this time! I had my mom make some too and she liked them a lot as well. Thanks for creating them! What a sweet comment! I’m so glad you love them like we do! I’m definitely going to make these, but can you tell me what size pan works best, or what size you use? Thanks! Yes! I use an 8×8 square baking dish. You can use any 2 quart dish you like. I’ll make a note of that in the recipe! These are AMAZING! As a Crohnie I have a hard time finding yummy baked goods that aren’t hard on my tummy! These are perfect! thanks so much for this!! Super grateful!! I’m so glad to hear that! Wishing you well! OK, these are GREAT. I am addicted! Thanks for sharing. Do you have an almond flour recipe for lemon bars? I am in love with these brownies. My whole house smells of chocolate! I used baking powder instead of soda and they are fabulous. Future ideas: peppermint extract, cinnamon on top, and remembering to spray the sides of the pan as well as the bottom. Thanks! Can I use bobs red milk 1:1 baking flour. Don’t have almond flour on hand. Sadie – Typically almond flour and GF all purpose flour aren’t interchangeable. I haven’t tried it in this recipe, but I’d LOVE to know how it turns out if you try it! Heather – I wish I could help! I haven’t tried it with stevia. If you do, I’d LOVE to know how it turns out so I can share that with others in the future! My daughter made these and it was the best brownies I have ever had. I have all the ingredients and I am definitely making them. Thank you! I’m SO glad to hear that! Thank you for your comment! Fabulous! Used butter and subbed baking powder for the soda after reading the comments. For sweetener, I used 1/3 cup Pyure and it was plenty. Best yet! Thank you!! I hope you love them as much as we do Gilda! I’ll be honest I was a little hesitant to try these, while I like paleo desserts my work colleagues are not always a fan. However I made them and you can’t even tell they are Paleo. My work colleagues didn’t even notice. I will be making these again for sure. Thank you! I’m so happy to hear that Victoria! Thank you for sharing!!! This recipe looks fab. One question: could you kindly tell me how much the 2/3 cup of choccie chips weigh (in grams if possible, though I can convert from ounces if needed). I’m not in the USA so have bars of dark choc which I’ll weigh out as needed. Absolutely! 2/3 cup is 4oz, which is about 115 grams. Hope that helps! Made these and everyone reported they were fab. Used Lindt lime dark choccie, the entire amount mixed in with the almond flour. I discovered that it is easiest to cut them neatly after putting them in the fridge. Thanks for a great recipe! Oh my HEAVENS. Lime dark chocolate sounds divine! I can’t wait to try that sometime! These were delicious! I used butter, baking powder, half coconut sugar and half regular sugar. I’m so glad to hear that Barbara! Thank you for your comment! Question for you- my boyfriend will likely input these into his fitness pal, I’m sure I could do each ingredient one by one but any idea what the calories for one brownie would be? Elizabeth – I’m so sorry! I don’t have the nutrition facts on hand. I usually use My Fitness Pal when I calculate them, too. I’m hoping to have nutrition facts on my site soon! Would like to try these, but need the nutrition value of them, since my husband and I are on a paleo/low carb diet. Linda – I don’t have nutrition software on my site yet (coming soon!) so you’d need to plug the ingredients into a free online calculator, like My Fitness Pal (the app or site). Hope you enjoy them as much as we do! These were divine! I used baking powder, added 1/4 tsp of cinnamon and 2/3 cup of walnuts, and used 1/2 cup of GF all-purpose flour (Bob’s Red Mill) since I didn’t have almond flour on hand. They came out fudgy and delicious – and were a big hit! Thanks! So glad you enjoyed them! I love the idea of adding cinnamon! I’ll try that next time! Carrie – I haven’t tested that combination, so I don’t feel confident in advising you. I LOVE the fudginess I get from all almond flour. If you do try the 50/50 combo, I’d love to know how it works out! These are amaaaazing! I was a bit worried since my chocolate chips didn’t get “glossy” they were more grainy- still turned out great! Heather – so glad you enjoyed them!!! I just made these as I’m always looking for new paleo recipes but for some reason the middle was little and the edges raised and crisp even when I followed the instructions. Any advice on how to fix this or why this happened? They still tasted great so as a quick save I served the mess over vanilla coconut milk ice cream, but I’d really like to try them again because the flavor was fantastic. Thanks so much! Claire – I’d love to help! Did you use baking powder or baking soda? Thank you so much for this amazing recipe!! Insanely yummy and easy. I subbed Nikki’s coconut butter for the coconut oil. Rich, dense, gooey, best brownie and not terrible for you! I’m SO happy to hear that! I’ll have to try it with coconut butter next time! Gabriela – Can you tell me what flours you have available? I might be able to help you come up with a mixture that would work as a substitute. OMG!! So good! You can’t even tell it is GF! Robin – I’m SO glad you enjoyed them!!! I tried it and LOVED. I was searching for a long time for a healthier brownies recipe that tastes good and chewy, your recipe turned to be perfect. Thank you for sharing. I have tried dark chocolate (85%). Wondering if 70% dark chocolate would taste better as they might be closer to the semi-sweet chocolate chips. Let me know if you have any recommendation. Hayfa – I’m so glad you enjoyed them! I do think that 70% would be closer to the semi-sweet chocolate chips. 80% is probably just a little too dark unless you wanted to add more sugar. Have a great day! I substituted GF flour for the almond flour and they turned out perfect! Amazing brownies! 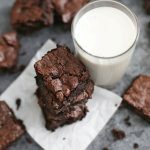 This is the best brownie recipe ever- gooy, satisfying, perfect flavour balance and texture and yet with health benefits. A big thankyou from a food lover and healthy eating fan. Oh my GOODNESS! What a sweet and wonderful comment to get today! Thank you so much! I’m so glad you enjoyed them! Looks delicious. I eat very low carb/keto and 2/3 cup of (coconut) sugar is way too much for me. Somewhere in the comments you wrote that more or less coconut sugar will mess with the texture. So do you think that if you use almost no sugar (say 20 grams) the brownies will fail or just have another texture? Karen – Great question! I’d be hesitant texture-wise and structure-wise. I think they’d be really dense and fudgy, but wouldn’t have any rise or crispness on the top, would have trouble setting in the middle, and would be on the bitter side. I know some friends who eat keto use other powdered sweeteners (like erithrytol) which might be able to give you similar results. I just can’t really guarantee results with that much less sweetener for this recipe. If you do give it a try, I’d love to know what worked for you! Hi Emily, thanks for your reply. Just tried the recipe; I used 20 gram of coconut sugar and only 1 tbsp of unsweetened cocoa powder. I didn’t put in extra chocolate chips, which probably was a mistake 😊 . I only put it in the oven for about 12 minutes. It didn’t rose very much and I found it also much drier than expected. Maybe the measurements were not quite right. I work with grams and 5 tbsp of coconut oil might be more than the 68 grams I used. There also might be a difference in egg sizes. Should an extra egg and more fat make it more fudgy? Just another question; is it possible for you to put the recipe also in grams? Hi 🙂 Do these freeze well? Right? I need to get that nailed down stat! So glad you liked the brownies! I’m a dessert lover who enjoys finding healthier ways to indulge in that sweet tooth. So as you can imagine, I’ve had some “Pinterest fails” over time. But it’s all worth it when you find that ONE magical recipe that becomes your “go to” when you want a less guilty cheat. This is it!!! Brownies are my favorite and these are just wonderful! Thanks for sharing and all of your comments/responses above help when wanting to tweak it just a bit. Great job on this one! So i’m new to your blog, stumbled upon it as I searched for a paleo brownies. found these!!! Ok I made these yesterday with few revisions (I didn’t have enough chocolate chips so I took that out, I baked them in muffin tins for only 12 mins, I also put baking powder, I had about 1/4 cup of chocolate chips which I melted in the microwave with coconut oil, little coffee and cardamom, drizzled that on top, OMG OMG OMG, these are soooo soooo ridiculously delicious!!!!!! me and my husb are only eating 1 per day but it’s so hard!!!! do you know much calories is in each cut/muffin? I am going to make these again!!!! ty! That glaze sounds delicious! I love cardamom! As for the nutrition facts, I don’t have them calculated, but I love using MyFitnessPal (the free site or app) for calculating recipes. It works great! Has anyone calculated the macros for these that they could share? Thank you! I can’t wait to try them. Can I use coconut flour instead of almond flour? I can’t wait to use this recipe for a valentines party in a few weeks! Kathryn – I wouldn’t. Coconut flour is NOT a 1-to-1 substitute for any other flour. It absorbs many times its own volume in liquid, so it would make REALLY dry brownies unless you adapted the recipe in other ways. I haven’t tested it for coconut flour, so I couldn’t advise you about how many more eggs, and how much more liquid, etc. you’d need to add to the recipe. Honestly! Fantastic. I made these for my sons 10th birthday. I subbed cashew flour for almond flour (baking powder not soda) as I can get the flour diner in my Vitamix than I can with almonds and they were perfect! Everyone loved thenm, thank you SO much!!! Wow! That’s so great! I’m glad to hear that. I’ll have to try them with cashew flour next time! Followed recipe but used baking powder. Very tasty! Nice top “crust”. Even better cold. Will make again. Only downside was dirtying up 3 bowls! I LOVE them cold! So glad I’m not alone! I LOVE these brownies so much, make them ALL the time and have even converted some non-GF friends and coworkers onto almond flour!!! I just learned that I am intolerant to coconut and am wondering if you have recommendations for a sugar substitute? I use olive oil (love the flavor) in all my chocolate baking already. Do you think honey / maple syrup would work? If so, how much would you recommend using? Thank you, thank you, thank you again for sharing this with all of us!!! I’m so glad you liked them and so sorry about your coconut intolerance. That’s such a bummer! Hmm… I haven’t tested liquid sweeteners in this recipe yet. In general, you’d use 1/2 the amount of liquid sweetener, but I’m not sure for this if other adjustments would need to be made. For granulated sweeteners, raw cane sugar (turbinado), white or brown sugars would work, as would maple sugar (which is paleo friendly, but somewhat tricky to find). If you give them a go with 1/2 the amount of syrup or honey, I’d LOVE to know how they turn out! Ha ha ha! I’ve BEEN THERE!!! I made these today. My husband has eaten 1/2 of them already. Excellent recipe. Thank You again Emily! I haven’t found a recipe that I don’t absolutely love. Ha! I’m so glad he’s enjoying them. And so glad YOU are enjoying them. Have a wonderful weekend, Shelley!!! I made these “perfect gluten free” brownies for my own birthday. My husband placed three candles on one decadent brownie with raw cream maple flavored icecream and sang Psalm67:7 over my life to me! The brownie recipe is better than store bought Betty Crocker’s baking mix! Thank you for your talent!!!!!!! I’m so glad they could add to your celebration! Happy birthday, Cynthia! I used half almond flour because I didn’t have enough for recipe and used the other half gluten free flour. They came out too cake like for me. The taste was great. I will try again when I get more almond flour. Beth – I’m guessing that was the GF flour, like you thought. Bummer! I’d love to know what you think when you get a chance to try it with all almond flour! Just tried this the 2nd time. First time with almond meal as I didn’t have almond flour, 2nd time (today) with refined rice flour as I am living in the Dominican Republic now. Also used unrefined natural sugar which is coarse, however, they turned out wonderful and tasty! Very fluffy. If you want to respond to Gabriela living in Ecuador (lived there also), tell her to use “harina refinada de arroz” (refined rice flour) which GOYA makes and also Bisonó. While living in Ecuador, I found yucca flour but it was way too gummy for baking cakes – only good for yucca buns. This time I also tried baking “soda” instead of “powder” and actually liked it better. I have to use the products here so I found sweetened baking squares and cut them into small chunks, I’ve also used organic 100% cacao (unsweetened) 1st time, and they were less sweet, but still tasty. Lastly, tried sprinkling sea salt on them 7-10 minutes before done but it melted in – better to wait until it comes right out of the oven! Thank you for this wonderful recipe! This is a keeper! Ruth – THANK YOU for all those helpful tips!!! Um, I am not even paleo and these are the best brownies I have ever had. Thanks for sharing! WOW! What an awesome review! Thank you so much for sharing this with me!!! WOW! I have tried several Paleo/Gluten free brownies and FINALLY, I’ve found one that my family and I LOVE. I used avocado oil and added the 1/4 teaspoon of nutmeg and they turned out perfect.. Amazing treat for everyone. They are in the oven for my sons birthday…. I make my own baking powder to keep the cornstarch out… 2 parts cream of tater to one part baking soda. These look fantastic! Do you think it’s possible to sub unsweetened apple sauce for the oil, like I usually do in a traditional brownie recipe? OMG! It looks so good, I cant wait to make them for easter! One question: did you use alcaline (dutch processed) or regular (raw?) cocoa? I only have the regular one, do you think it would work? Thxs for the great recipes! I used regular! It’ll work great! I just made these and they are amazing! I used a bar of 74% chocolate. Thank you for the recipe! Replaced your 2/3 cups sugar with sweetener blend (xylitol/erythritol/stevia) but still find it too sweet. Really ‘beat d hell outta it’ with the eggs! Will do it 1/2 cup instead of 2/3 next round. Amazing texture and none of my friends believe it’s a sugarfree & gluten-free brownie! Sounds like you have a great plan for next time! Can you use coconuts flour as a substitute? Samantha – No, I’m sorry you can’t. Coconut flour behaves VERY differently than almond flour and absorbs several times its volume in liquid. Coconut flour recipes need extra liquid and usually additional eggs. I haven’t tested this with coconut flour, so I couldn’t advise you about adapting it. If you substitute coconut flour for almond flour, your brownies will be VERY dry and crumbly. This didn’t work out for me. I followed the instructions exactly, the brownies came out super flat and stuck to the bottom of the pan despite using nonstick spray. After waiting for them to cool off, I tried to get them out but since they were super flat (literally no “puff” at all) they just crumbled. I used baking powder instead of baking soda as other reviewers recommended. Any idea what went wrong? Elissa – I’m so sorry they didn’t work out! I’m so curious what happened!? I haven’t heard anyone else report those results yet. It sounds like you did everything right… I wonder if by chance your baking powder wasn’t fresh? That’s literally the only thing I can think of since you didn’t make any other substitutions. Made these last night and my husband never came close to guessing at the ingredients! I followed the recipe exactly and made no substitutes. Even my mother-in-law, who follows a very strict gluten free and paleo diet AND doesn’t like trying things other people have made, LOVED them so much! She asked me to make more asap (such a compliment)! This recipe was perfect! The hint of coconut flavor just goes perfectly with the dark chocolate and the dark chocolate does not make the brownies bitter at all. We paired these with some Halo ice cream and had an amazing, guilt-free dessert. This recipe is being sent to everyone I know immediately! Wonderful job making this recipe, Emily!! I truly cannot thank you enough! I LOVE hearing this! You made my day!!! They are my all-time favorite brownies ever (gluten or not!). They always get rave reviews when I serve them. I can’t get enough!!! Sami – I usually make it in two batches. That way the edges don’t burn while the middle stays underdone in a larger pan. That said, many people have doubled it and report loving it! These were AMAZING! The whole family loved them. Thanks for the great recipe!! I’m so glad you loved them! They’re my ALL TIME favorite brownies! Is there any way I would be able to use honey or maple syrup instead of the sugar? Mia – I haven’t tested these with liquid sweetener since that can tend to mess with the texture a bit. If you want to try it, I usually swap half the amount of liquid sweetener in place of granulated sweeteners in other recipes. If you do give it a try, I’d love to know how it goes! Just wondering about baking these. Has anyone tried using honey yet? Would love to know how they turned out. No one has reported back about trying it with liquid (honey or syrup), but if you give it a try I’d love to know how it goes! I made them with honey last night! I used 1/4 cup. Really great! Maybe it is due to the extra moisture, but by this morning they no longer had any crunch and are soft on top after storing covered, still great though! Samantha – I’m so glad you enjoyed them! I’m wondering if it was the honey. Typically, liquid sweeteners don’t produce the same strength/crispness as granulated sweeteners. This recipe makes an 8×8 pan. If you’re halving it, the bake time would depend on what pan you’re using. If you’re using a loaf pan, you’d probably want to check them after 10-15 minutes or so and go from there. If you’re using something wider, you’d want to check them earlier. What are the macros on this? I used butter & brown sugar without the added chocolate chips. They were amazing and my Celiac granddaughter loved them. Definitely will make a double recipe next time. I’m so glad to hear you enjoyed them! We LOVE them!!! Okay, I have commented on more recipes in the last 2 weeks than ever before in my life! I only comment on stellar recipes, and here I am! These are AMAZING. I made my own chocolate chunks, because paleo chocolate is unheard of in my area. Even with their “homemade” texture, these cake out absolutely amazing. My 9 year old asked me to make them again for her birthday on Saturday, they’re that good! I was a bit short on coconut sugar, so I added a bit of maple syrup, and they were perfect. I also used baking soda, and still had good results!! Ahh! I’m so glad to hear that! YAY!!! Hi there! I’m planning on making these soon because they look so delicious. Would 100% cacao chocolate work in place of the melted chocolate chips? Also, if I want to replace the baking soda with baking powder do I use a larger amount of baking powder or keep it the same? Thanks! Eliza – You’d keep the baking powder measurement the same. As for the chocolate, 100% cacao is completely unsweetened, so these would be much less sweet and more bitter unless you increase the sugar. If you like it that way, you can make the switch, but otherwise, they’ll likely be a bit on the bitter side. I usually use 70% chocolate (semi-sweet/dark). I just made your brownies with chesnut flour and they were delicious. I will definitely cook them again. Yum! I bet that’s delicious. I’ll have to try it some time. Thank you so much for sharing!!! EMILY …brownies are just amazing. Ahh! You made my day! I’m SO GLAD! They’re my absolutely FAVORITE brownies. I’m so glad you loved them as much as we do! Just made these and they are amazing! 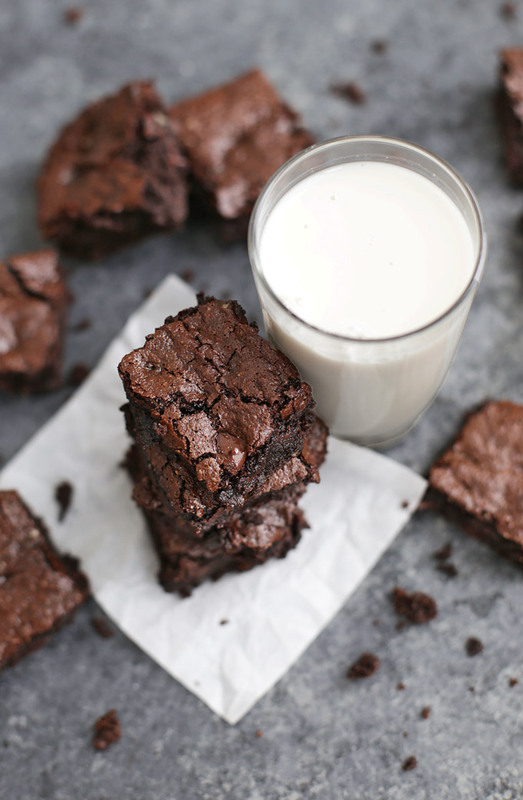 I’ve always struggled to make a good brownie, but these are just perfect! 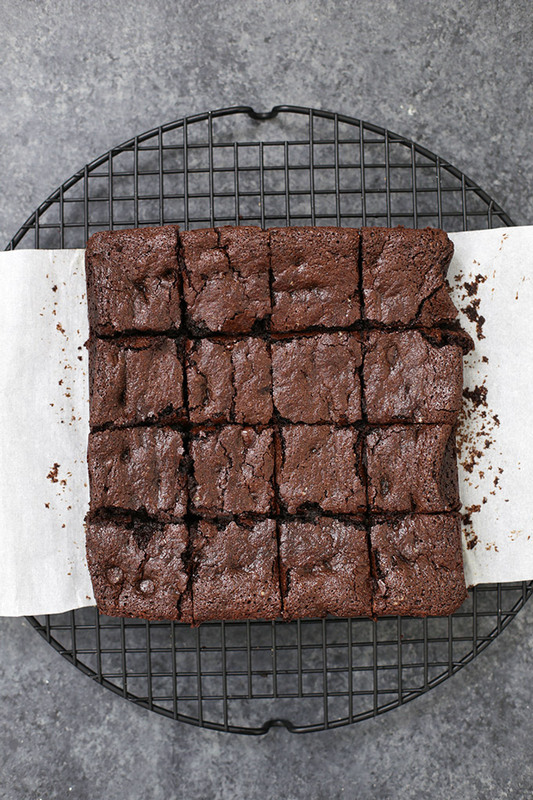 Fudgy, dense centre, chewy edges, perfectly chocolately… all that I dream for in a brownie. Will definitely be making again and again! Thank you Emily! Grace – I’m SO glad to hear that! Honestly, that’s exactly what I love about this recipe, too. It’s just perfect! Loved these except they were very thin. Didn’t rise , I used the baking powder maybe I will use soda Nextel any other suggestions? I’m so glad you enjoyed them! That’s curious about the thin brownies–what size pan did you use? Sometimes if you use a larger pan (even a 9×9 vs and 8×8) it can make a difference. I used Ghirardelli 60% Cacao bittersweet chocolate baking chips, coconut oil, maple syrup instead of sugar and baking powder. I sprinkled the salt on after I took it out. It came out great. I am a chocoholic so always looking at the healthiest way I can eat my favorite chocolate treats. I’ll be making these again and probably try adding cinnamon and nutmeg like I saw in some other comments to see how it comes out. Yum! That sounds delicious! thank you so much for sharing! Can I use quinoa flour instead of almond flour? If so then would it be the same quantity? I have never tested this with quinoa flour, so I’m not sure! If you give it a try, I’d love to know how it goes! I found this on Pinterest…. Best gluten free brownies I’ve had so far! I cut the recipe in half and used a loaf pan instead of an 8×8, used Trader Joe’s blanched almond meal, and used stevia instead of sugar (not the 1:1 baking blend so I followed ratio on container which was about a 1:3 ratio of stevia to sugar). I also prefer a fudgey texture so I used just baking soda instead of powder as the original recipe calls for, so the sides did rise more than the middle but it still tasted great and texture was fine for me. Even my boyfriend loved them too! Oh, YUM! I’m so glad you enjoyed them!!! Miya – What other cocoa powder would you substitute? WOW! This is amazing. Thank you so much for your tips! I’m sure lots of other folks will love to try them your way, too! Hi Emily. These brownies are perfection! My first batch resulted in a more cake like brownie, so for the second batch (today), I used 1/4 tsp baking powder, mixed the sugar then the eggs into the melted chocolate without wisking them first, used Earth Balance instead coconut oil, and half white and half brown sugar, since I can’t have anything coconut. They are everything I hoped for in a brownie: fudgey, just the right amount of chocolate, with a delicate top crust. After trying so many brownie recipes and not liking any of them enough to make again, I am so happy I found your recipe. I can stop searching. 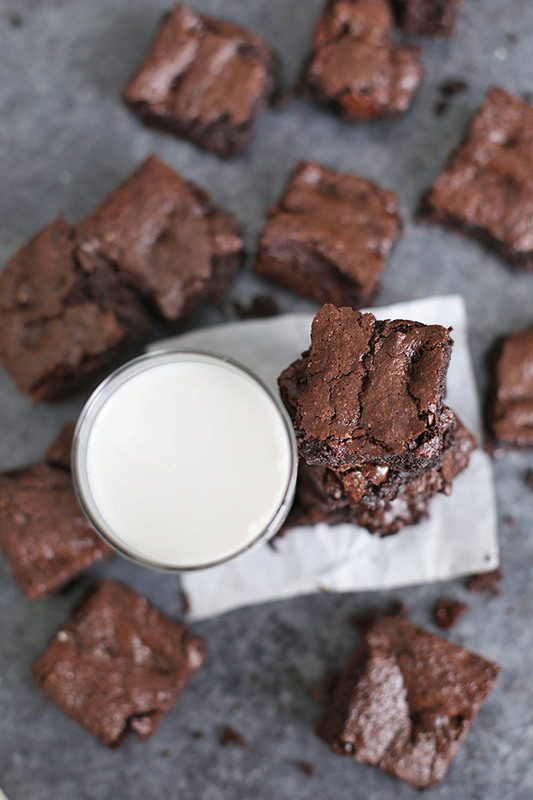 This is definitely the best brownie recipe, I love that it is sweetened with coconut sugar! We used Whittakers 70% Dark Cocoa chocolate instead of chocolate chips. It makes a small amount so next time will double. I’m SO GLAD you loved them! They’re my absolute favorite! This recipe is so perfect! I poured them into cupcake liners so I could properly portion them out without eating too much in one sitting. I love recipes that use simple ingredients and these are soooo dangerously good. 10/10 will be making these again and again! I’m so glad you enjoyed them Elena! You totally made my day! Hi there! Loved your recipe! I actually used 1/4 cup of coconut flour instead because Im sensitive to almonds and it came out great! (Less coconut flour is needed than almond flour as it is more absorbent for anyone considering trying). Thanks again will def make in the future! Cindy – Thanks for the tip! I’ve been too intimidated to try it with coconut flour, knowing I’d need to play with the amounts a bit. Thanks for passing that along! This looks amazing! I would love to try but don’t have any chocolate chips on hand. How would you recommend I tweak the recipe? Thank you! Lexi – I’m so sorry I’m just getting this! This recipe won’t work if you don’t have some kind of meltable chocolate–whether that’s a chocolate bar or chocolate chips. If you try to omit it, the texture will get messed up and they won’t be as chocolatey. I’m sorry! I was impatient and made this without parchment paper as I didn’t have any in the cupboard! I didn’t wait for it to cool completely either before removing from pan. The result an ooey delicious broken mess! All the better to eat with a fork I say!!! Will make it with paper next time and (maybe) be patient and wait for it to cool first!! Really though, if something tastes that delicious why wait until it has cooled!!!!? Thank you so much for bringing this recipe into my life! Im currently in Italy and was thinking of using a flour by a company called garofalo – the description say “least strong flour. Perfect for short leavening – up to 8 hours – at room temperature. Ideal for pies, shortcrust pastry and small pastries.” any help on the conversion of almond flour? thank you in advance!! Ashlyn – I’m so sorry. I haven’t any idea! I’ve only ever tested it with almond flour. I’d love to know how it goes if you give it a try! No worries!! That was a randomly specific question haha. What about just using a cake/pastry blend? 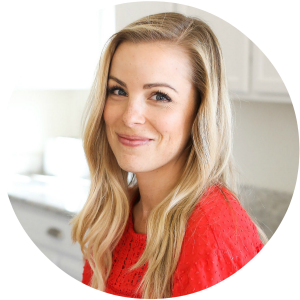 Ashlyn – I can’t guarantee results (since I can’t test any flour that contains gluten), but it’s worth a try! YAAAAAY!!! I’m so glad! Thank you for sharing! I’m sure your results will be helpful to others in the same boat! I love this recipe! I tweaked it a little and it came out amazing! I didn’t have chocolate chips so I mixed avocado oil with a bit of raw cacao and sugar, then heated them on low. I also used almond meal because it’s what I had on hand. I also added a cream cheese swirl on top. I only baked them for about 15 minutes. They turned out incredible and soooo fudge like. Definitely going to make these again!!! What a clever substitution! So glad you liked them. Lexi – I’m so glad you enjoyed them! I do think the texture difference was because of the substitutions you made. Almond meal and oat flour would produce a different texture than blanched almond flour, and the sugar would also have some structural differences. It sounds like you made them work for you! Yay!!! Holy Sh*** this recipe was AMAZING!!! I am eating them right now haha and they are delicious. Moist, taste a LOT like chocolate. Heaven! 🙂 Was a bit sceptic because they are paleo but they are perfect! HA! I’m SO glad you loved them! They’re my all-time favorite brownies. AH! Carolyn, you totally made my morning. They’re my ALL time favorite! These were excellent!! Thank you! Alison – I haven’t tested any nut-free flours in this recipe, and don’t think the ratios would be quite the same. If you’re not using nut flours, you may like one of my older brownie recipes, like this one or this one! I’ve been on the hunt tonperfect the perfect keto brownie that tastes good, moist not dry, not crumbly, is dense, rich, chocolatey. This gluten free brownie was the perfect base as I am sugarfree and gluten free(so I had to play with the ingredients). The first time I just subbed erythritol (granular) for the sugar 1:1, and used sugarfree lily’s Chocolate bar (1/2 cup melted) to melt and for added chunks. I could tell these bars were really good, but my subs made them fall apart after they had cooled( fromerithryitol). I ate the whole pan still , in 3 days by myself, with a spoon since it was crumbly 😂. I knew we were onto something!! Next try, I subbed egg yolks only to equal 2 eggs ( mega “ribbons” ) and I used powdered swerve and more, added more cocoa powder and more butter. And 💥 BOOM . The best brownie EVER. My husband and I ate the whole pan within 24 hrs ( even when it was hot and gooey right after the oven!) . I’m SO glad you enjoyed them! And THANK YOU for sharing your Keto subs! I know there will be lots of folks who find that helpful! Delicious! I reduced sugar to ½ cup and the oil to 4T and they were still fudgy and sweet enough! Yum! So glad you enjoyed them. Thanks for sharing! WOW!!! You just made my day! Thank YOU! Melissa – I haven’t made these without eggs. If she tolerates the yolks, you could try doubling and do 2 egg yolks, otherwise, I recommend a powdered egg substitute, like Neat Egg, Ener-G egg replacer, or Bob’s Red Mill egg replacer. I hope that helps! OMG! This recipe is simply prefect! Super delicious brownies. Thank you!!! Oh, I love hearing this. THANK YOU so much for sharing! Have you tried baking this in a 10 inch cast iron skillet? Any idea if this would yield a tasty result and if I should alter the baking time? I don’t want to sacrifice ANY of that fudgy goodness. Thanks! I haven’t. I know cast iron gives a nice crust on the edges, but I’m not sure how long you’d need to adjust the baking time so you still have a good fudge-y middle. I’m sorry! Thanks Emily for designing this gluten free brownie! I made it yesterday for my birthday. My husband placed three candles on a big brownie square with icecream and sang to me on my birthday! The brownies are wonderful! Better than Betty Crocker’s! I also topped the brownies with chocolate glaze. Yum!!! Would honey, bananas, or applesauce work instead of sugar? If so, how much? Thanks! Nikki – Not if you want the same taste or texture. I’d for sure stay away from bananas or applesauce if you want a fudg-y texture, but some folks have tried subbing pure maple syrup instead of the coconut sugar in the past (1/2 as much). I haven’t personally tried it, so I can’t guarantee the amounts. Omg these are the best brownies ever. Made them today and my family loved them we ate them all in one day. YAAAAS! I love hearing that!!! So glad you loved them! Can they be refrigerated? My son is asking for creme de menthe brownies and our wheat brownies needed to go in the fridge so the creme de menthe middle wouldn’t melt with the melted chocolate drizzled on top. I’m so excited to make these! Carol – Absolutely! I LOVE them from the fridge (or even freezer!) I just cover them whenever possible so they don’t dry out. If you’re covering them with creme de menthe and chocolate, that’ll provide a “seal” of sorts. You should be in great shape! I hope your son LOVES them!!! I finally tried this recipe, and they cane out delicious and slightly fudgy and cakey. They even had that crusty top and look like brownies too. I used Lakanto monk fruit erythritol mix, Wellbee’s almond flour, half butter half coconut oil, and baked them on 350 drgrees for about 23 minutes. Sarah – Ha! I know the feeling! We polish them off SO fast every time!!! I just made these the other day… WOW! They are soooo fudgy and delicious. It’s hard to find a gluten free recipe that is delicious, but this nails it! Thank you!!! *side note- I added toasted coconut to the top of it and it was perfect! Oh no! I’m so sorry that happened. I wonder if you’re right, or if something accidentally didn’t get doubled correctly? (I’ve done that once before and it was SUCH a bummer!) I hope it never happens again! Cassandra – I’m so sorry to hear that! You can absolutely leave out the additional chocolate chips that stud the interior, but you can’t leave out the ones that are melted into the batter. The texture would be too greatly impacted, since they also provide a lot of the structure. I’m sorry! I think the 2/3-cup chocolate chips would be fine considering the quantity of the overall batter. I just won’t add the extra chips. And I’ll pace myself (and share) the end product 😁 Thanks for your help! This recipe is PERFECT as written. YUM!! I was afraid the almond flour would make them too dense, but it does not. I even added a few chopped walnuts. The title of these is spot on! Thank you for this recipe! hi, can i take out the chocolate chips or do i have to replace them with something? i’m doing a sugar free diet! Sasha – You must include the first 2/3c chocolate chips (that you melt) for structure reasons. The second 2/3c (which you stir through the batter as a mix-in) can be left out. You might like Lily’s stevia sweetened chocolate chips for a lower sugar version! I really like the brownies and so did my sister, who is the one I primarily made them for. I used homemade blanched almond flour, I use maple syrup with coconut sugar, also instead of chocolate chips I made some coconut oil, cocoa powder, coconut sugar mixture. They tasted good, but was kind of soft, so next time I will make homemade chocolate chips with cocoa butter to help out the consistency. Thanks for the recipe. Yum! That sounds like a great way to experiment! Hey! I’m really excited to make these but I was wondering if you measure the coconut oil liquified or solid? Thank you! These were amazing. Decadent, dangerously good:) Thank you. Ha! That’s the PERFECT description for them! Practically perfect in every way!! I set out to find a gluten free brownie i coukd take friends who were gluten free and fell in LOVE with this recipe. I love it so much i make them weekly and prefer the over box! I double the recipe without any problems. Highly, highly recommend this recipe! These are amazing!!!! I used monk fruit sweetener in place of coconut sugar, and I used baking powder instead of baking soda. I’m not a big chocolate fan, really made this as a healthy alternative for my kids, but they are delish!! Thanks for posting this awesome recipe! I’m so glad they were a hit! And thanks for reporting back about using monk fruit! I’ve never used it, but several folks have asked if it works. Glad to know it does! Can I substitute almond flour with coconut flour? You can’t, I’m sorry. Coconut flour isn’t a direct substitute for any other kind of flour because it behaves so differently. Coconut flour absorbs several times its own volume in liquid, so it will produce very dry, crumbly brownies if you substitute it here without adjusting the other liquid volumes (eggs, coconut olive etc.). I haven’t tested it successfully adapting it for coconut flour yet. Best Gluten/dairy free brownies ever!! Ive made them a couple times and will make them many more. Thanks for coming up with this one! Lori – We just LOVE THEM! I’m so glad you’re enjoying them too! Thank you so much for sharing this–you made my day!